Omar Zehery, right, speaks as, from left, Jesse Garrity, Amber Washington and Josh Unterbrink listen during a forum of under-40 residents held at The Lima News on Thursday. 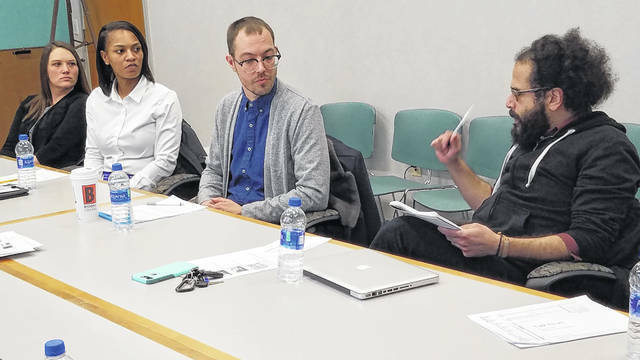 LIMA — To better understand issues affecting the region’s population loss, The Lima News held two discussion sessions featuring a group of young individuals to hear their concerns about Lima’s future. The goal of the event was to help address the region’s workforce issues by proposing the question: “What is the best way going forward?” to a representative group of under-40-year-olds. Called the Under 40 Forum, participants voiced their opinions on a number of issues that ranged from lack of entertainment options to the region’s perception problems. Reporters worked to facilitate the conversation. Information gathered from the two sessions will be used in an upcoming Lima News series titled “Their Turn?” Currently planned as an occasional series, the first story to be published April 7 will focus on the concept of buy-in and inclusion associated with new ideas. Future articles will center around housing, entertainment and how other major metropolitan areas affect Lima. Demographically, Allen and its surrounding counties have a small concentration of adults under the age of 40 compared to major metropolitan areas. According to the 2017 American Community Survey, one-quarter of Allen County’s population is made up of adults under 40. In comparison, the same demographic comprises one-third of Franklin County’s population. Such concentration has helped grow Franklin County by roughly 100,000 people — or Allen County’s entire population — in less than a decade. Allen County has seen higher migration numbers in recent years, but the region’s mortality has kept overall population down. The Lima News also made preliminary results of its Future of Lima regional survey available to the group to encourage discussion on the issues presented. Preliminary survey findings show that age is not a significant factor differentiating what individuals look for when considering housing options, and that both safety and price are primary concerns when individuals seek housing. The least important housing factor identified for both those under 40 and over 40 is a location’s proximity to downtown. Survey results will be made available to the wider public upon redaction of personal identifying information. Videos of both forum sessions will also be made public for those interested in viewing the conversation. Future sessions of the Under 40 Forum around specific issues may be scheduled if there is enough interest. To be involved in such an event in the future, email Josh Ellerbrock at jellerbrock@limanews.com.